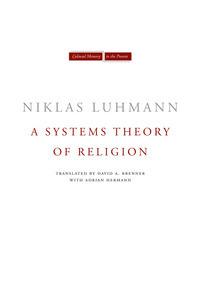 This October, Stanford University Press will publish A Systems Theory of Religion by Niklas Luhmann (translated by David A. Brenner and Adrian Hermann). The publisher’s description follows. A Systems Theory of Religion, still unfinished at Niklas Luhmann’s death in 1998, was first published in German two years later thanks to the editorial work of André Kieserling. One of Luhmann’s most important projects, it exemplifies his later work while redefining the subject matter of the sociology of religion. Religion, for Luhmann, is one of the many functionally differentiated social systems that make up modern society. All such subsystems consist entirely of communications and all are “autopoietic,” which is to say, self-organizing and self-generating. Here, Luhmann explains how religion provides a code for coping with the complexity, opacity, and uncontrollability of our world. Religion functions to make definite the indefinite, to reconcile the immanent and the transcendent. Synthesizing approaches as disparate as the philosophy of language, historical linguistics, deconstruction, and formal systems theory/cybernetics, A Systems Theory of Religion takes on important topics that range from religion’s meaning and evolution to secularization, turning decades of sociological assumptions on their head. It provides us with a fresh vocabulary and a fresh philosophical and sociological approach to one of society’s most fundamental phenomena.